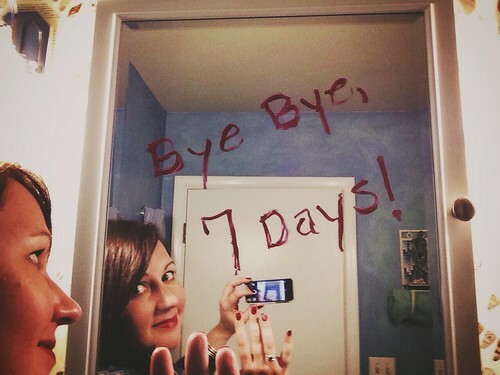 A Big Selfie Sendoff to 7 Days! For the last five years I've had the pleasure of being a part of an online photo group, 7 Days. Four times a year, for the last seven years (I only joined on Bethany and Joe's suggestion in 2009) but for seven excellent years, this gang of photographers has taken a self portrait every day for 7 days once a season. We posted our sometimes creative, sometimes genius, sometimes mundane photos online through Flickr and then we commented and chatted and got these sharp glimpses into each others lives. Through births and deaths, joy and sadness, we made friends. We connected, and we shared some great photography. So this last round just wrapped up right after Christmas, and it's the final round for the group. I've been eyeballing this guy for years. He hangs on the bathroom wall in my mother-in-law's Wizard of Oz themed guest room. 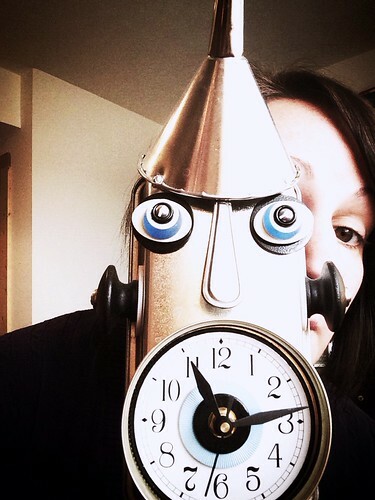 He's shiny, he's slightly creepy and he looks a bit like a mask. So Merry Christmas from the Tin Man, Dorothy, the Lion and the rest of the gang that we're sharing our room with over the holiday. And no, I didn't grow a mustache. "Let me stick this on my money stack." We had a great night tonight. Just a cozy night in at our dear friends' house, soup and sandwiches, way too many Christmas cookies. Then the games came out. 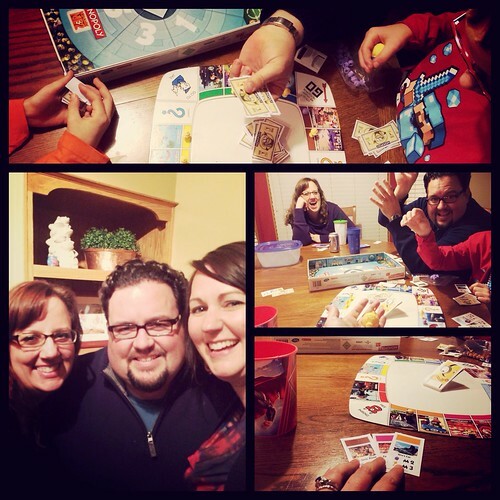 Playing Despicable Me Monopoly with two of Katrina's sons and my husband. Guess who was more competitive, the kids or Joe? Guess who threw all his winnings into the air to "make it rain" and then tidied up his money with the "let me stick this on my money stack." I'll give you a hint, he's the one who's over 30. Dinner and a movie is one of my all time favorite night type activities. 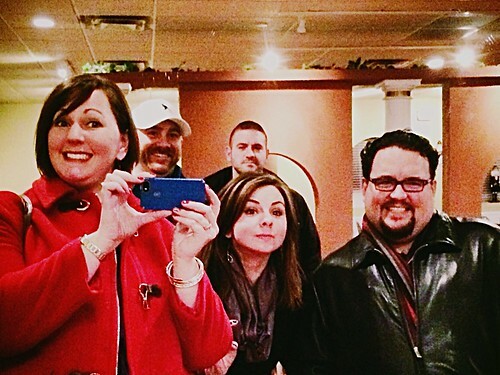 So add in a few of my favorite people, plus Greek food (with a huge mirror and mural of course), plus all of the fantastic holiday movie choices (we picked American Hustle) and our Monday night was pretty choice. How was yours? We're out running errands on this sleeting frigid Christmas Eve. Joe ran into Costco to pick up some photos he had printed for his mom. And I wisely waited in the car. This was a weird year for me, us really. A lot of ups and downs, I finally gave up on having any illusion of control, and we mixed some grief in there for good measure. But there are some exciting and slightly scary things awaiting us next year that I'm very much looking forward to. When I'm sitting somewhere quietly lately, I get contemplative about it all. I get a little sad. I over analyze it and get a little lost in my thoughts and fears. 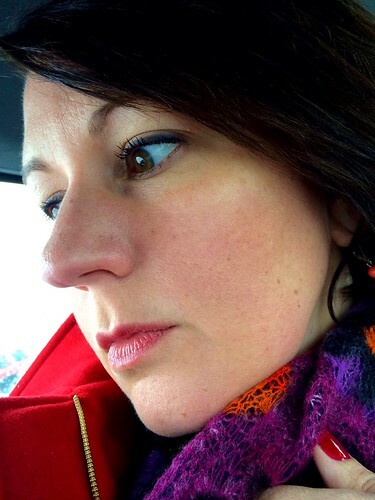 I worry and brood, while staring at all the shoppers scurrying through the parking lot off to finish errands so they can spend the day with their families like we are. But my brooding doesn't last long. Joe pops back in the car and breaks the spell, with his smile and his energy and his love, and I realize just how lucky I am. 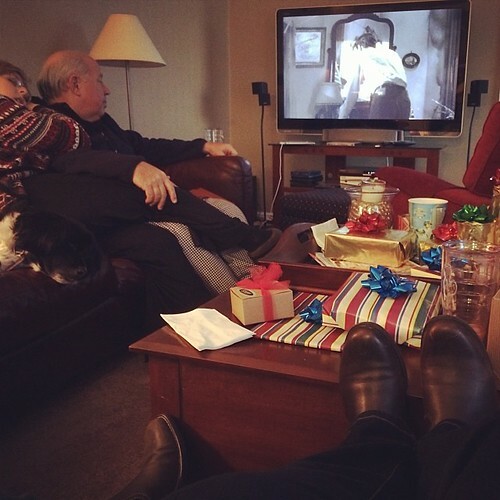 It's a Wonderful Life on the tv, my parents, dogs, a fire in the fireplace, presents, snacky dinner, and the husband. Aren't the holidays lovely sometimes? Going back to work after the holidays is one of those painful times filled with post holiday malaise, food regrets, exhaustion, and the desire to return to the days of presents, friends and family, naps, cookies and Santa. I missed Santa today as I worked on spreadsheets. So as my work day wrapped up and I ran some non-holiday errands, I made sure to make a stop at the library. 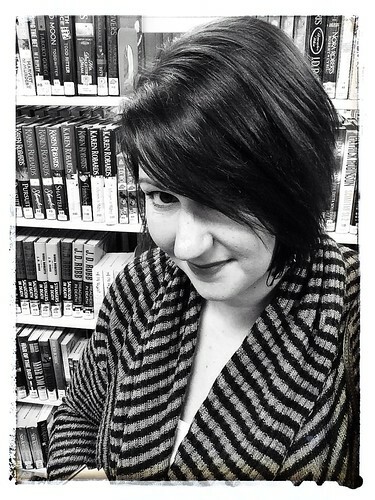 I always smile while at the library. I can't help myself. All the potential and possibilities awaiting me. The knowledge and laughs just right there. Plus sometimes they have free cookies. So it seemed only appropriate to take a library shot, on this our last 7 Days round. And I did get caught by one of the elderly librarians, she just shook her head and shuffled away from me mumbling under her breath, "cell phone cameras..." So what's one of your happy places, friends? It's been a pleasure. A challenge. A hoot. And a true delight to "meet" you all. Thank you for letting me peek into your lives over the last years. Your lives are as beautiful as you are. I've made some amazing friends from this quirky little selfie group and my life is more colorful, more creative and just more because of 7 days, and you. Yeah, I'm talking about you. So good bye for now and let's see each other again soon, ok? I am never going to be pregnant. I'm never going to grow a baby inside of my body, some magical combination of centuries of DNA from Joe's family and mine. Melded into a mysterious and lovely little person. It's not going to happen. And that's a hard thing to admit to myself. It's a hard thing to absorb. Not because we know who that person would have been or what that person's laugh would have sounded like, but because they never existed. We aren't grieving that person, we are grieving the simple idea, the whisper, the hope of that little person in our lives. And that's one of the hardest, most elusive, and most painful things I've ever had to feel. It's a sharp pain some days. Others days it's nothing more than a slight lump in my throat while watching a child throw a tantrum in Target. Some days there's even a bit of relief that my body will always belong just to me. But December has been hard. Waves of grief and loss creep up at the oddest times. And especially around the holidays, which I've always loved. They were a little bittersweet this year. I've felt like I've been walking around in a bit of a daze this last month. Not grieving a death. Not grieving a tangible, concrete loss. But grieving an idea, a dream, a hope and a joy that we won't get to experience. And that feels strange, and yet still deeply painful sometimes. But I'm getting ok with it. I'm getting to the next place, the place that says, ok, we want to be parents, above DNA and placentas and Lamaze classes, we want to be parents. So we'll find a way to do that. But this wispy sadness will always be with me, I think. This little "what if?". We did everything we could to try and have a biological baby. No regrets. But that "what if?" will always linger. Who would that little person have looked more like? Would they have had Joe's curly hair and my height? Would they like to ski or dream of being president or hated algebra with a fiery passion? Who would that person have been? And I'm allowed to wonder that. I'm ok with wondering that. Because we'll never know. But I get to wonder that because I know that we will be parents to a real live child, not a dream, not a whisper. Not a biological child, but our child nonetheless. Joe and I will have a home filled with laughter and fun and bedtimes and books and joy and tears and chaos. We will have that. It's just going to come to us in some form that we can't understand yet. It will happen. I know it. And I think the challenges of the last year have actually prepared us for the next challenges ahead. I feel tested and stronger and better able to sit with my own feelings and let them happen. And I think these are skills Joe and I both will need in the coming year. So as much as I am sad, I'm excited and scared and nervous about what happens next. Who will we be meeting? Whose laundry will I be doing someday? Who will we be helping with homework, and cuddling while watching movies, and grounding for a week, because that's inevitable, right? I have no idea. But I can't wait to meet them.